I had 2 stints in Singapore Air Movements. In 1963 I did 3months detachment at Paya Lebar [civil airport]. In 1969-1971 I was stationed at Changi, I did cargo and pax, it was good to get another look at a trim sheet. I left the RAF in 1974, but I think I could still do a trim sheet. We used to handle civilian/military flights into Paya Lebar from Changi Creek. Things must have hotted up for you to have a permanent detachment. I well remember the pokey little arrivals hall, about the size of a large shed!! Of course that has all changed now. Changi is now the civil airport and if you haven't been there recently I can tell you it is MASSIVE. Probably one of the biggest and best in the world. I was over in Malaya a couple of years ago and it is changed to the point where it is hard to recall where everything used to be. As an ex-Mover you should sign up with Tony Gale's MAMS site. Tony is in Canada and produces an online newsletter each week which will pop into your mailbox every Friday. There are hundreds of ex and current Movers enrolled and we all get the chance to make contributions of our past (and present) experiences. When you have a few hours to spare have a trip down memory lane and soak up some nostalgia. Who knows just who you may bump into from the past! Have a gander...........you will be impressed. I read with interest the articles on Salalah and it reminded me of my last trip which must have been in '70 or '71. I was with Delta team in Masirah. There had been an outbreak of food poisoning and we, together with teams from engineering , ATC and Catering etc., had gone out to provide cover until they traced the source and the people had recovered (I believe they traced it to powdered orange juice in the end). We were segregated completely from the station personnel and lived in tents close to the Movements Section. Hughie Curran and I got nominated to load a water bowser for Salalah into a Herc and then fly with it to do the offload. As the flight was then going on to Cyprus the possibility of escape sounded worth the trouble. However, as usual, there was a cunning plan which involved stopping overnight and then loading a Landrover into an Andover and returning to Masirah. As I remember it the bowser was non-standard with very little accurate info as to either axle or total weight and no trace of any tie down scheme. Not at all dismayed, we loaded it and decided that as we had to take it off at other end we would be a little minimal with the tie down. As usual the crews' only concern was that as we were we going with it it must be OK. The bowser bounced well on take off but once we had tightened it all down it looked ok and the flight was totally uneventful. About 15 minutes out of Salalah the Loadie wandered down and casually remarked that we were going to practise an attack landing. Five minutes and a few chains later the bowser was firmly restrained. We landed and taxied into the area mentioned in several of the articles which was protected by walls of 45 gallon drums - painted around them was the old recruiting slogan, "It's a Grand Life - With Sport Thrown In". Having finished our unload and sorted the loading and departure times out for the morning, we retired to the billet where we had camp beds on the floor of the Mover's hut and wandered from there to the NAAFI bar. After a beer or two everybody suddenly laid down on the floor and the NAAFI Manager started crawling round distributing free beer. On enquiring what were the origins of this strange custom I was informed that the banging noises in the vicinity meant we were being mortared and the floor was the safest place to be! Eventually it all quietened down and we spent a pleasant evening returning uneventfully to Masirah the next day. Subject: 1500572 Jones E... Sah!! Received this email message today from 'Andy', no other info supplied... I am not familiar with the number... Boy Entrant? Apprentice? Maybe someone from the group may shed some light. I will pass on any " light shed " as appropriate. E. Jones, RAF Changi, 1960, 1500572. The above inscription was on the back of a wrist watch I recently purchased through an estate. Can you give me any additional information on Jones. Whether the watch would have been common issue. As well, if you can enlighten me as to the 7 digit numbers meaning? Anything would be greatly appreciated. The Ministry of Defence has said it is doing what it can to improve the conditions of servicemen and women in Iraq where temperatures are hitting 120F. A number of soldiers from units within 19 Brigade claimed troops are without basic welfare including air conditioning and cool water. One military policeman, evacuated recently with "heat prostration", told the Herald newspaper there were 40 others with the same condition on his flight alone. There are currently 12,000 UK servicemen and women in southern Iraq. Personnel who spoke to the paper said basic facilities had remained the same since the war, even though temperatures had soared. A corporal said: "If you can't sleep because of the heat, your efficiency and general health decline rapidly. People are in a state of collapse after three or four days. "Most of us are still "bird bathing" in water from bowser trucks poured into metal or plastic basins." The MoD said the living conditions of troops in the Gulf was a serious issue. "Given the intensity of the heat out there, we are doing our very best to improve conditions for our troops to ensure that they acclimatise to the heat," a spokeswoman said. Now Michelle and I are officially “Team Clarke- Canada”, I have changed our e-mail address to reflect this important and very excellent change! Any mail to the cj.clarke@cogeco.ca address will not be read. I am looking for a picture of a Sunderland Flying Boat. George Strachan, the secretary of the Aberdeen Indoor Bowling Club, served on them in 1953 at RAF Tengah, Singapore. Could anyone come up with info so that I could present him with a picture? The United States has found evidence of an active programme to make weapons of mass destruction in Iraq, including "truly amazing" testimony from Iraqis ordered to dupe United Nations inspectors before the war, the man leading the hunt said yesterday (31 July 2003). David Kay, a former UN inspector and now the CIA's leading consultant who is joint head of the Iraq Survey Group (ISG), offered an unprecedentedly bullish assessment of the hunt for weapons of mass destruction. Although he called for patience, he predicted that doubters were in for a "surprise" by the time his work was done. His 1,400-strong team of American, British and Australian experts scouring Iraq has not yet found actual biological or chemical weapons, Mr Kay told private Senate hearings in Washington. But there was mounting evidence of an active WMD programme, he said. That evidence included documents detailing how to conceal arms plants as commercial facilities, and for restarting weapons production once the coast was clear, officials told reporters. Leading Democratic congressmen, like many Labour MPs, have questioned pre-war claims made by President George W Bush and Tony Blair that Saddam Hussein had large arsenals of banned weapons, ready for use. Such critics have said they will not be satisfied by anything short of physical proof. But the first significant evidence of programmes to develop WMD is a potential lifeline for Mr Blair in his battle to prove to a sceptical public that the war was justified and that the Government did not mislead Parliament. There was a sense of relief in Whitehall yesterday that the Prime Minister, who has staked his reputation on the Iraq war, could yet be vindicated. After all the controversy over the Government's earlier claims about Saddam's weapons, Mr Blair is being deliberately cautious in public. However, he will leave for a family holiday in Barbados considerably reassured. Officials said he was "aware that progress is being made" but was anxious not to overstate what had been uncovered so far. At his end-of-term press conference in Downing Street on Wednesday, the Prime Minister appeared more confident that evidence of weapons programmes would be found and urged his critics not rush to judgment. He referred to the interviews being conducted by Mr Kay's team with scientists and experts who were working on Iraq's weapons programmes. Asked specifically if they had found something, Mr Blair replied: "Let us wait and see when they come up with their report what the true facts are." Mr Blair has already sought to prepare the public for the growing possibility that no actual weapons of mass destruction will be found - only evidence of programmes to develop such weapons. Glenda Jackson, the Labour MP for Hampstead and Highgate and a former minister, said the Government had argued before the war that there were actual weapons not just programmes. "We were not told the danger came from programmes or documents - that we were in real danger from tons of confetti. If the weapons aren't there, then I am afraid someone deliberately misled us," she said last night. In Washington, Mr Kay appeared concerned to stem the growing perception that Saddam might have had no weapons programme at all. Though a former UN inspector himself, he was blunt about the limitations of the inspections before the war. Briefing officials and Congress on the first five weeks of work by the coalition team, he said: "We have found new evidence of how they successfully misled inspections of the UN and hid stuff continuously from them. "The active deception programme is truly amazing once you get inside it. We had people who participated in deceiving UN inspectors now telling us how they did it. "We have Iraqi scientists who were involved in these programmes who are assisting us in taking them apart." After the private briefing, he said: "We are making solid progress. It is going to take time." He said a programme shielded by security and deception over 25 years would not be easy to unravel. Mr Kay dismissed reports that his search teams had run out of sites to explore. They were gaining the "active co-operation" of Iraqis involved in WMD manufacture. Scientists and officials were coming forward in ever greater numbers and were leading the teams to key sites, almost all of them previously unknown to Western intelligence. Solid evidence was being uncovered, but would not be made public hastily, until the teams had "solid proof", Mr Kay added. However, he predicted that public patience would be rewarded. A Washington DC based company requires a Cargo Operations Manager for their new Office in the UAE. This is an exciting opportunity to build and manage a new Operations Office in a dynamic and fluid environment. The Cargo Operations Manager position will be busy and rewarding. Able to motivate staff working long hours in exacting conditions. The postholder will have the following background and experience: At least 15 years as a Commercial/Military Loadmaster OR at least 15 years in the Air Force specializing in Mobility/Air Movements. Knowledge of Cargo Aircraft Loading Procedures ( IL76 preferred but not a necessity ). Knowledge of Aircraft Weight and Balance Techniques. Knowledge of IATA Dangerous Goods Regulations. Most importantly, the successful candidate will be completely customer focused and will understand modern quality principles. This contract is for 6 to 12 months ( renewable ). Attractive salary and benefits package. Here's a little snippet: As of 7th April 2003, the strength of the RAF in terms of manpower (and womenpower!) was 52,804 which included 4,169 currently under training. A windswept night at the Yacht Club. Left to right: Ian Woodward, yours truly, Danny Haigh, John "Legs" I'Anson, Paddy ? (RSD & a wicked man when holding a hockey stick. Do you remember that "friendly" match Legs? You ought to, nearly had me as a Casevac case! ), Don McKay, Don "Mad Dog" Hazlewood (who still owes me a night out in downtown Chatham - a bet is a bet), Dave Watson & Mick McCann. As far as I know it was the only kiss 'n' tell going on! The new Chief of the Air Staff, Air Chief Marshal Sir Jock Stirrup, has taken up his new post. 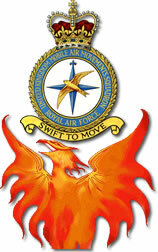 Sir Jock replaces Air Chief Marshal Sir Peter Squire from 1 August 2003. 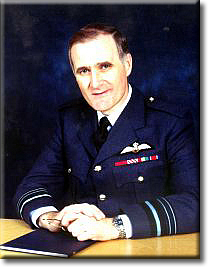 Air Chief Marshal Stirrup was educated at Merchant Taylors’ School, Northwood and the Royal Air Force College Cranwell, and was commissioned in 1970. After a tour as a Qualified Flying Instructor he served on loan with the Sultan of Oman’s Air Force, operating Strikemasters in the Dhofar War. Returning to the United Kingdom in 1975 he was posted to No 41(F) Squadron, flying Jaguars in the Fighter Reconnaissance role, before taking up an exchange appointment on RF-4C Phantoms in the United States. He then spent two years at Lossiemouth as a flight commander on the Jaguar Operational Conversion Unit, and subsequently attended the Joint Service Defence College in 1984. He commanded No II(AC) Squadron, flying Fighter Reconnaissance Jaguars from Royal Air Force Laarbruch, until 1987 when he took up the post of Personal Staff Officer to the Chief of the Air Staff. He assumed command of Royal Air Force Marham in 1990, just in time for Operation GRANBY, and then attended the 1993 Course at the Royal College of Defence Studies. He completed No 7 Higher Command and Staff Course at Camberley prior to becoming the Director of Air Force Plans and Programmes in 1994. He became Air Officer Commanding No 1 Group in April 1997 and was appointed Assistant Chief of the Air Staff in August 1998. He took up the appointment of Deputy Commander-in-Chief Strike Command in 2000. At the same time he assumed the additional roles of Commander of NATO’s Combined Air Operations Centre 9 and Director of the European Air Group. He spent the last few months of his tour, from September 2001 to January 2002, as UK National Contingent Commander and Senior British Military Advisor to CINCUSCENTCOM for Operation VERITAS, the UK’s contribution to the United States led Operation ENDURING FREEDOM in Afghanistan. Air Chief Marshal Stirrup was appointed KCB in the New Year Honours List 2002 and took up his post as Deputy Chief of the Defence Staff (Equipment Capability) in March 2002. Air Chief Marshal Stirrup is married with one son and enjoys golf, music, theatre and history. He is appointed Chief of the Air Staff on 1 August 2003. In rural Carbon County, PA, a group of men were drinking beer and discharging firearms from the rear deck of a home owned by Irving Michaels, age 27. The men were firing at a raccoon that was wandering by, but the beer apparently impaired their aim and, despite of the estimated 35 shots the group fired, the animal escaped into a 3 foot diameter drainage pipe some 100 feet away from Mr. Michaels' deck. Determined to terminate the animal, Mr. Michaels retrieved a can of gasoline and poured some down the pipe, intending to smoke the animal out. After several unsuccessful attempts to ignite the fuel, Michaels emptied the entire 5 gallon fuel can down the pipe and tried to ignite it again, to no avail. Not one to admit defeat by wildlife, the determined Mr. Michaels proceeded to slide feet-first approximately 15 feet down the sloping pipe to toss the match. The subsequent rapidly expanding fireball propelled Mr. Michaels back the way he had come, though at a much higher rate of speed. He exited the angled pipe "like a Polaris missile leaves a submarine," according to witness Joseph McFadden, 31. Mr. Michaels was launched directly over his own home, right over the heads of his astonished friends, onto his front lawn. In all, he travelled over 200 feet through the air. "There was a Doppler Effect to his scream as he flew over us," McFadden reported, "Followed by a loud thud." Amazingly, he suffered only minor injuries. "It was actually pretty cool," Michaels said, "Like when they shoot someone out of a cannon at the circus. I'd do it again if I was sure I wouldn't get hurt."